After migrating a WordPress site to a new URL either to a live production site or a testing development server, the new URL strings in the mysql database need to be changed and updated in the various mysql database tables. This method just uses the whole mysql database rather than a WordPress export/import from within, and is best suited for a straight swap. So you would copy all the WordPress files/folders to the new destination, set the correct ownership to those files, then run the database update / migration script. First, do a mysql database export of the old database on the old server, create a new blank database on the new server, import the old data either in phpmyadmin. 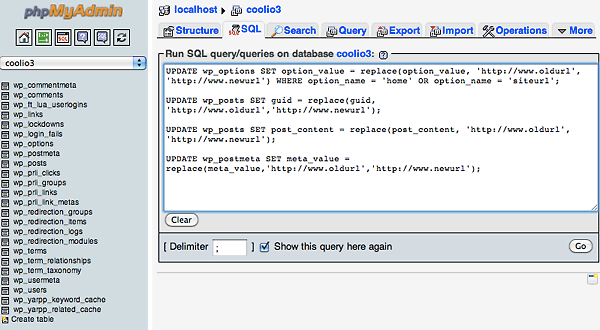 Make sure you have the new database selected, then run some sql updates and replacement commands on the tables notably, wp_options, wp_posts, wp_postmeta. Copyright (c) 2000, 2010, Oracle and/or its affiliates. All rights reserved. Now everything should link up perfectly. djave has created a nice and easy script that takes the old and new URLs and hands you the sql code for the WordPress swap, nice! Sometimes issues may arise with a problem called serialized data which is when an array of PHP data is somewhat like encyrpted with the actual URL, so if the URL is changed the data is gone. There are 2 brilliant tools that can handle serialized data and do a search and replace on the old and new databases for the URL and leave serialized data intact. First up is a script you run via uploading it and browsing to it after migrating and importing your old database into the new – this will then make those necessary changes. Get it from here. WordPress 4.5.1 is available and addresses a dozen items reported against WordPress 4.5. According to Adam Silverstein, “a singular class issue that broke sites based on the Twenty Eleven theme, an incompatibility between certain Chrome versions and the visual editor, and an Imagick bug that could break media uploads,” are among the bugs fixed. A detailed list of changes can be viewed here. WordPress 4.5.1 is already being pushed out to sites configured for auto updates. If you’d rather not wait or have auto updates disabled, you can browse to Dashboard – Updates and click the Update Now button. If you encounter an issue or believe you’ve discovered a bug, please post it in the troubleshooting section of the support forums. WordPress 4.5, the next version of WordPress is already in development and is targeted to release in April 2016. We just saw the release of WordPress 4.4, and the latest security and maintenance version WordPress 4.4.1 was released earlier this week. The core development team has now published a project schedule targeting its release in mid-April. The current target release date is April 12, 2016. The beta-1 version of WordPress 4.5 is planned to release by the end of upcoming February, and three more beta versions of the software will be released before the final release candidate. 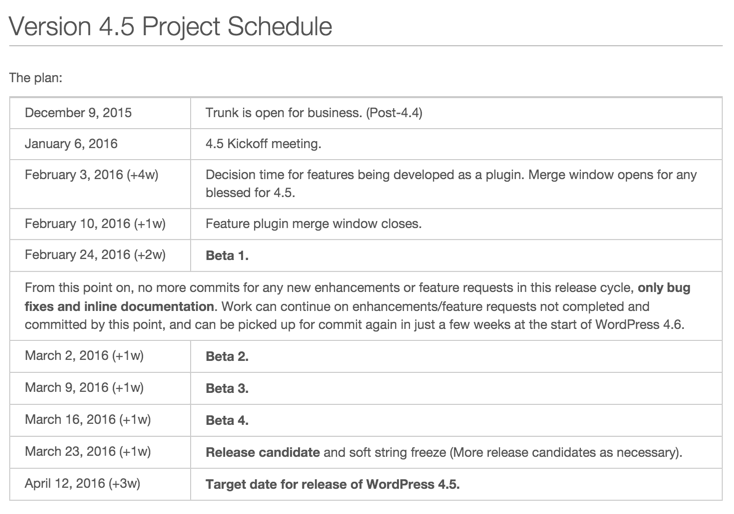 Here’s the planned chart showing the project schedule for WordPress version 4.5. WordPress core developer, Mike Schroder is the release lead for the version 4.5. He will be assisted by two other release deputies, Mel Choyce, and Adam Silverstein. Announced at the latest core developer chat, Adam Silverstein will support as the release deputy and Mel Choyce as the design deputy for WordPress 4.5. As you can see in the project schedule, all new enhancements and feature requests for the version 4.5 will need to be added by the release of Beta 1 version. All the new features are first worked on as plugins and are decided to be merged in the core over the course of development. Improvements with customizer including customize pane resizer and customize device preview. Improving Post Edit and Publishing process. Two-Factor Authentication for WordPress – See the current version plugin here. Background Image Cropper – enabling cropping to background images in the Customizer, similar to the header images. See the plugin under development here. Shiny Updates – removing the ugly bits of updating plugins and themes. WP Toolbar Experiments – some potential UX changes to the WordPress toolbar. WordPress REST API (Version 2) – of course, the complete version of WordPress REST API we all have been waiting for! You can see more of the feature plugins being developed here. I am excited about the improved image compressions, HTTPs improvements and the Two-Factor Authentication for WordPress. What features are you expecting and excited about in the WordPress 4.5? Let me know in the comments below. We provide Business Web Hosting, Web Development, WordPress Support and Maintenance and Search Engine Optimisation Services. We have been using Net Ninjas for around 5 years now. They have always provided prompt and professional support when required. Very happy with the speed and the quality of their web hosting services and the friendly customer service. Fantastic, would highly recommend! We've been working with NetNinjas for several years and right from the start the service has been amazing and support friendly and responsive.